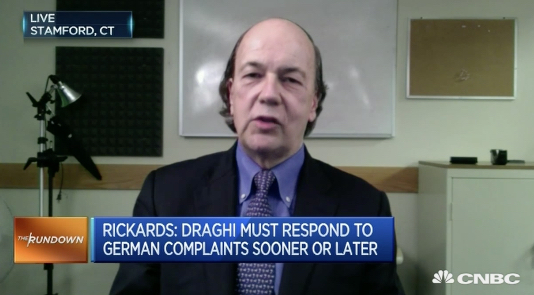 Jim Rickards joined CNBC’s The Rundown to offer his analysis for 2017 and what expectations for the European Central Bank (ECB) may be under rising Eurozone inflation and various regional factors. Jim Rickards is the New York Times bestselling author of The Road to Ruin. Rickards has worked previously on Wall Street for several decades and has advised the U.S intelligence community on topics surround currency wars and capital markets. When asked what specific areas that the head of the European Central Bank might be focusing his attention on Rickards indicated, “He’s got to look at average inflation across the entire Eurozone. That is why Draghi didn’t tighten now. James Rickards on how to avoid another financial crisis. Where should you position your money? What can you do? Is the collapse avoidable? In this video, James Rickards breaks all of these questions down and attempts to dispell some of the myths that exist out there, while at the same time, not sugar coating the future. Bad times are ahead, but profits can still be made. James discusses: Gold shortages; Gold Banks; Negative Interest Rates; Paper Money Collapse; Pound Sterling; Gold Standard; Digital Currencies; Cyber Financial Warfare; Hyperinflation; and BREXIT.